Ever wonder which animal in your area is the most fatally dangerous? Thanks to Man vs. 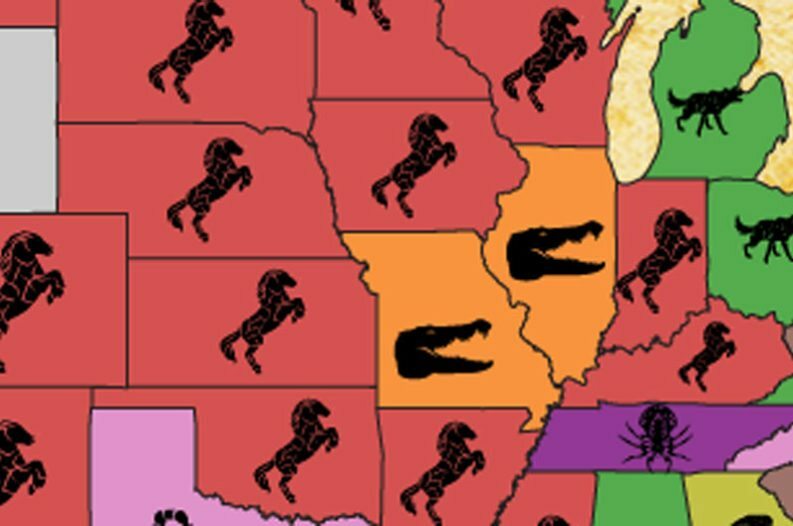 Beast, we can see which animals pose the most threat per U.S. state. If you think poisonous spiders and snakes are the deadliest animals in the country, you may be surprised. As it turns out, you're more likely to be killed by a cow. The most prevalent animal-related death in the U.S. appears to be due to being bitten or struck by a large mammal. That could mean, deer, bears, cows or horses. Texas and North Carolina share the same big threat -- the scorpion. One shocking statistic is that Florida needs to worry more about insects than alligators! Deer take the top spot at the deadliest animal in America. Of course, you have to consider that most of these fatalities are due to car accidents. Coming in second place, are bees, wasps and hornets. Allergies likely play a large part in this statistic. Surprisingly, dog attacks rank third and snakes fall fairly low on this list. And for those terrified of black widows, just realize that you have a better chance of being killed by a horse than the shy spider. If you have a fear of death-by-animal, New England may be the place for you! According to these findings, Massachusetts, New York and Maryland are three of the states where you're least likely to die an animal-related death. On the flip side, Montana, West Virginia and South Dakota have the highest odds of suffering an animal-related death. America is the continent with the lowest odds of dying from an animal. Looking at these lists, we really lucked out with the animals that live here. The other lists are terrifying. I don't know what a sloth bear is, but I don't want it. To collect worldwide data, Man vs. Beast took a list of known deadly animals and analyzed the number of yearly fatalities. U.S. data came from CDC WONDER's animal-related causes of death. For more interesting information on the deadliest animals around the world, head over to Man vs. Beast.